POLICE are appealing for witnesses following a serious collision on the A27 near Worthing yesterday night. In information just released, they released more detail about the incident. They said at around 9.45pm last night, a blue Peugeot 206 with four men inside was heading west when it left the road near to the junction with Hollyacres and collided with a lamp-post. The driver, a 19-year-old man from Rustington, suffered serious injuries and was taken to the Royal Sussex County Hospital where he remains. 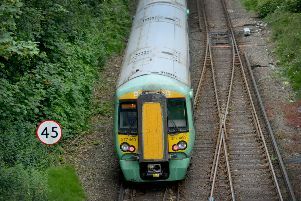 Two passengers, an 18-year-old man from Rustington and an 18-year-old man from Littlehampton both suffered serious injuries and were taken to hospital. A 19-year-old passenger from Rustington suffered minor injuries and was also taken to hospital. The road was closed for more than seven hours for rescue and recovery work, reopening at around 5.15am this morning. Sergeant Neil Walker said: “We would like to hear from anyone who witnessed the collision, or who may have seen the car prior to leaving the dual carriageway.